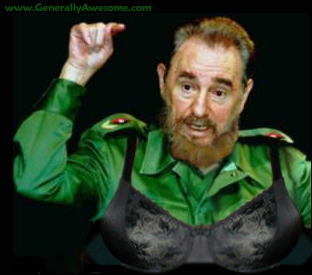 Communist icon Fidel Castro makes a startling revelation. Havana, Cuba In a shocking revelation Cuban leader Fidel Castro made public a very intimate piece of information about a mainstay of American retail. The announcement uncovered one of the most closely guarded mysteries of US consumerism�just what was Victoria�s Secret? Now we have the answer, her secret is that profits from her popular, upscale underwear line have gone and continue to go to Communist Cuba. �It now appears that Victoria�s Secret has been giving a lift to Cuba�s sagging economy for years,� professor of Caribbean Economic Studies John H. Crabtree told GA via e-mail. Others confirm that the underwear giant has been padding an otherwise flat fiscal outlook, thus making the small island nation seem more attractive to the international community. �We have seen a far-flung cross-section of young people from across the globe who have become enamored with Cuba. Today�s announcement may change the feelings of at least some of those individuals,� Crabtree added. While some are calling such measures treason, company representatives are saying that their only intention was to provide a solid foundation for Cuban society. Although many hold no hope for the lone Communist hold-out in the Western hemisphere, Victoria & company continue to have faith that this little country will someday blossom.